I was inspired from Teresa at her Northwest Sourdough website to try her sourdough cinnamon rolls pictured there, but the closest actual written recipe I could find to that was her Festive Hawaiian Roll recipe. After studying a lot of other sweet dough recipes and brioche recipes, I decided to make a hybrid dough with what I thought were the best aspects of each, that would also use only sourdough starter as the leavening agent. The main differences from NWSD's recipe is my addition of eggs and buttermilk, plus I added 4 times the amount of butter, bringing the butter content up to 11%, which is still not as high as many sweet doughs and not nearly as high as brioche. 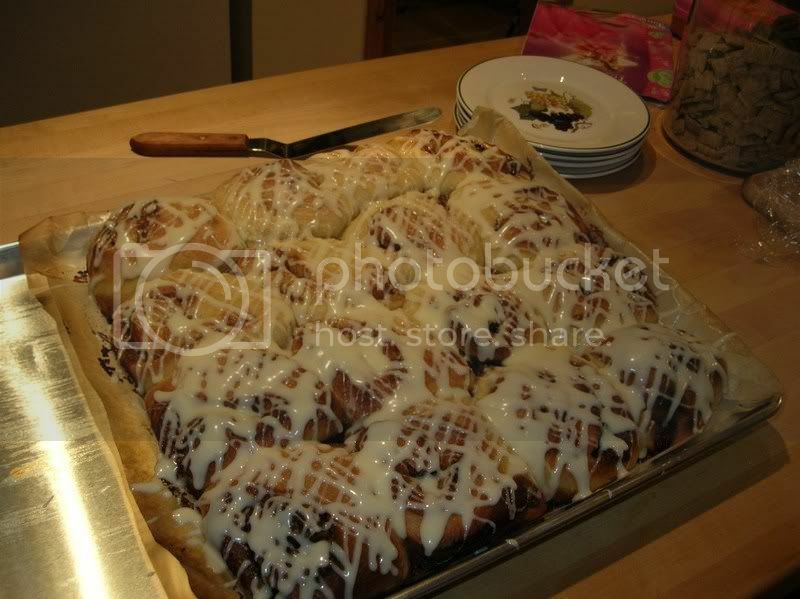 This recipe will make about 16-24 large and airy, but rich and tender Cinnamon Rolls. We don't like excess cinnamon flavor in our rolls and so use about half the amount of cinnamon usually called for in the filling of similar recipes. We are also not *fond* of white fondant glaze, so I made up this cream cheese/buttercream glaze to provide a more flavorful topping that complements the flavor of the rolls well. I also did not use any nuts in these, but they could also be added to the filling if desired. 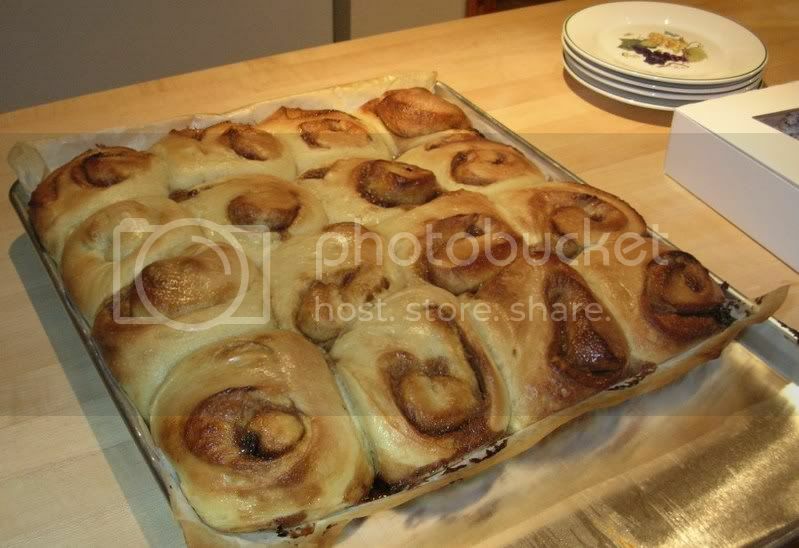 Beware of these rolls: Due to the potato and buttermilk in the dough, these are by far the richest, most moist, tender, and flavorful cinnamon rolls we've ever had, the dough itself is fragrant with vanilla and butter, it almost does not need the filling or icing. The sourdough made these extraordinarily airy and puffy with no commercial yeast added. Because these are so rich, they will be reserved for special occasions or special visitors in our house, they are far too addictive to keep around otherwise. Because they are also so light and billowy - similar to a good sourdough waffle, they are not overly filling and heavy in your stomach. Slice each log into 8 or 12 rolls (depending on how big a rectangle you rolled out and how large you want the rolls to be) with serrated knife and place them just barely touching each other on baking parchment on sheet pan. Don't worry if log gets flattened as you slice each roll, you can straighten them out once placed on the sheet pan, and they should rise very high and straighten out when proofing. Spray tops of rolls lightly with cooking spray, cover with plastic wrap, and slowly proof rolls overnight or up to 12 hrs. in the refrigerator or cool place between 45 and 55F until the dough is about doubled and puffy looking. Bake right out of frig. at 400 degrees for about 25-35 minutes until light golden, or until the center of dough registers about 195-200F on instant-read thermometer. Do not let the rolls get very brown. Melt about 4 TBSP of butter in microwave and as soon as rolls are out of oven, brush them with the melted butter to keep crust soft before icing them. It's a good thing we had a house full of guests this past weekend to help us put away not only the cinnamon rolls, but also these Vermont Sourdough boules, and cherry-sunflower-seed levains. Your rolls are lovely and by your discription I'm left drooling all over my keyboard! !...we have a real weakness for cinnamon rolls around my home. 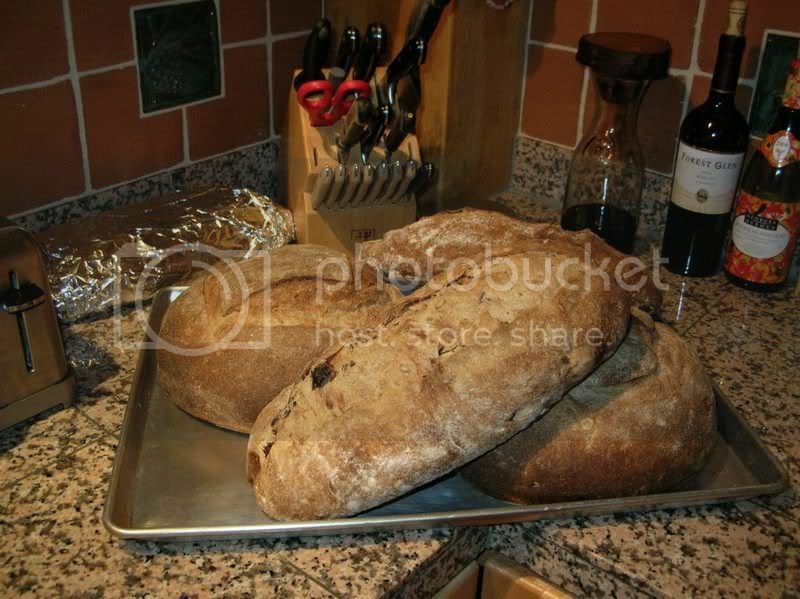 Your breads are all so lovely and appealing...bet your guests were thrilled! Thanks Sylvia - your beautiful sourdough cinnamon rolls you made last month gave me the craving! I did see that recipe on NWSD's main site, but I don't think that dough recipe is what she actually used when making those Hurricane rolls, because she mentions the mashed potato, so I figured it was her Hawaiian roll dough adapted. I wanted to try using mashed potato as I know that would increase the tenderness, but I also wanted to use eggs and butter, so I sort of improvised. Yes, the guests loved them, they hit the spot, their appetites were huge after two full days sledding in our field and skiing. Thanks Caroline, the cherry sunflower is just a modification of the cherry pecan bread I wrote about here. I was going to use pecans and I accidently let the last ones I had on hand get burnt when toasting them, so had to toss them out for the deer (I forgot how fast that oven heats up when no baking stone is in it...). I didn't have any other nuts on hand so just tossed in some raw sunflower seeds. Somebody had a busy weekend! I can smell those cinammon rolls from here! (HaHa) They look absolutely fantastic, as do your breads. I can see hanging around here with you guys is going to be bad for my waistline, but sooooo worth it. These look delicious! Would you mind if I featured them on the homepage? Hi Floyd - of course, I'd be flattered, as always...thanks! They're beautiful and look very luscious, Mountaindog. I've got a cholesterol screening coming up soon, so I think I better put these on my "to be baked" list for now. Your rolls are gorgeous! I've been making cinnamon rolls for years and always wondered about how they'd taste with sourdough. The photo of the unglazed rolls makes me want to give them a little poke - they're so fluffy! Mike, it was a busy but fun weekend bake. Surprisingly, I didn't mess anything up like I usually do when multi-tasking 3 different recipes at once. Lindy - you are wise to postpone this...I need to not make this again until next Christmas, or at least Thanksgiving. In fact, a good antidote to this is to make your beautiful flaxseed loaf next (I hear flaxseeds are like lipitor...). Moriah - they were very puffy. I also forgot to mention that they were not at all sour tasting, but very flavorful. My wheat starter is very mild. I would not receommend using a really sour starter like a rye one in this. Maybe if I incorporate some of those flaxseeds into your beautiful and devilishly tempting rolls, I could assuage my guilt. So, so good! Those look like what I have been trying to make. I like the idea of sourdough cinnamon rolls, but mine have been too heavy. Yours are beautiful! Lovely cinnamon rolls and breads. 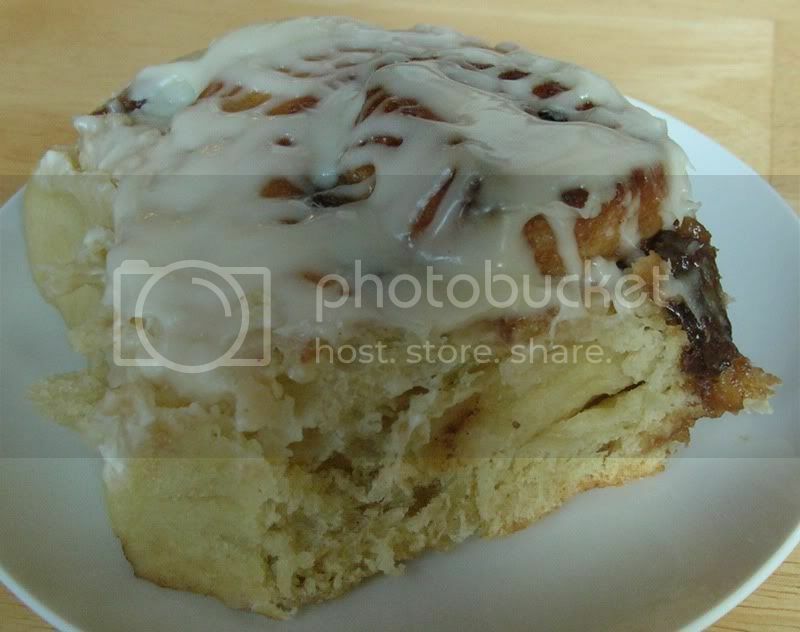 I will save your SD cinnamon roll recipe to make in celebration of losing 5 pounds. I need the motivation. That's some pretty good eats you have here! See now you have all of us tempted to flee our diets and jump into your sweet rolls. They doooo look good! The attempt at making amends for your shameless display of calories was completely negated by the included link to hansjoakim's pastries! Let's see your recipe for lowfat yogurt. All I want to say is WOW!! 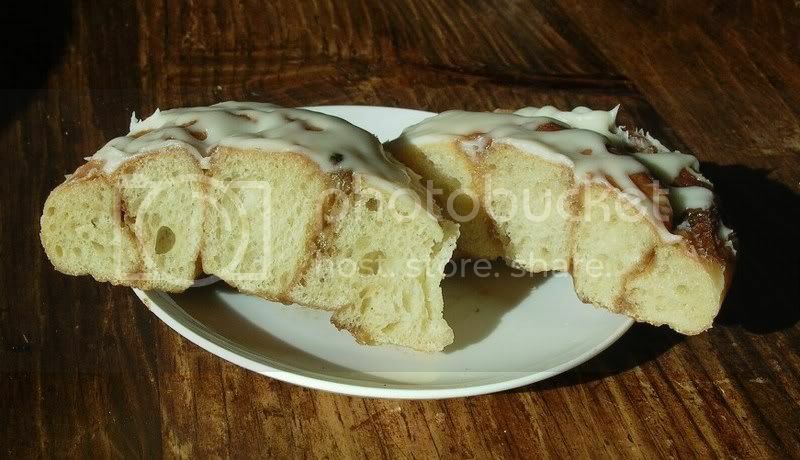 I hope to try this recipe very soon, I'm a sucker for cinnamon rolls. Thanks Magnus and bigphredo, I hope you enjoy the recipe. If you make these feel free to post any pics here of your results, and let me know how you liked them. Below is what an inexpensive version looks like ($10-15 US) and is the type I use, most supermarkets sell them here in the US in the kitchen gadgets aisle. It is good to get one that displays in both Fahrenheit and Celsius. At the link here you can purchase various types of these from Amazon.com. A very high quality one is the Thermapen, but it is much more expensive. I have a Thermapen and I love it. 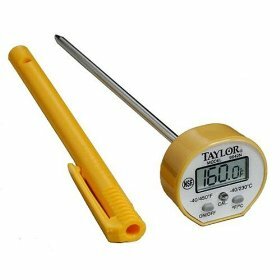 Note: Thermapens come in either C or F unlike most other thermometers. is that the same one .. wich i use for steak..?? the answer is yes. It is one that you would stick into whatever you are testing for just a few seconds. The picture of your rolls was enticing, but the desrcrption below it left me drooling! I just started baking and have a sourdough starter at home that I cannot wait to use for this recipe! Excellent I made these!!!!! BUT>>> i felt the dough was a bit too slack and I was wondering if the weight of the ggs was correct as I measure my eggs by weight. I think 225g is not correct for the number of eggs called for??? or is it a super slack dough and I should have strched and folded more???? Help I want to make these again soon!!! Even with my slack dough these were a huge hit with my family and farm crew!!!! Any danger with the eggs? I made my own version of this recipe last weekend and they turned out gorgeous, but I must say I was apprehensive of leaving dough with eggs in it out to proof for so long. Is there danger of the eggs spoiling with so much countertop proofing. We ate them and were just fine, but as far as recommending the recipe to others, I am a little hesitant because I don't want to get blamed for getting others sick. What is your opinion? I did an overnight bulk rise, punching down twice before refrigerating, then a very slow final proof (once overnight, and another time, over more than half a day). You're right, these grew tremendously. I was surprised by how tall and strong they rose. So to anyone making these, i would say shape buns, if making, on the small side - they grew so much my filling became lost in them - and give them sufficient space to grow in tin. Mine, as you will see, became a bit monstruous. Also, the tang from the slow rises was quite prominent. I liked this but it went down less well with the eaters. I'll experiment with proofing times the next time. But this definitely lived up to its name as 'billowy'. Very fluffy yet strong, very delicious. THanks! I made these for my annual Boxing Day party, subbing out the filling and glaze for my usual (which used to also be my bun recipe), and everyone loved them. Thanks! Like others, I wondered about the weight for the eggs being far too much - I wonder if you had weighed them before cracking them? I simply used three large eggs (~160g, broken) and still ended up with a super slack dough which was virtually unmanageable. I will try again, but reduce the liquids to end up with something more manageable. these are simply amazing. I made them yesterday and baked up this am. I was hoping to do a little sho bulk fermentation, to have these for weekend breakfast treat. So I kept the dough warmer, around 85 degree ambient temp. And they were done with bulk in less than 4 hR. I didn't have dark brown sugar so I had to sub light brown. I then did overnight proof in 60-65degree ambient temp for about 8-10hr. Woke up to Huge pillowy buns. put them in the oven 25min. Prefer a thicker cream cheese frosting, and that's what I had on hand from previous recipes. Even with my adaptations, they came out fantastically. I was drawn to this as I was also working on a Hawaiian bread recipe over at northwestsourdough and had starter built for there (though I kept it at 100%) and also had mashed potatoes for both recipes. But most importantly, you had me at the billowy-less cinnamon-heavy vanilla part. That's exactly how I like cinnamon rolls too. Anyway, whole family approved and loved. I can't wait to make these for guests someday. I think they'll be sure to impress. Thank you! Next time I will make sure to have dark brown sugar too! That's the only change I'd make. And maybe do a cooler bulk, so the dough has a little more structure.